Enjoy a comfortable, stylish space to sit and sleep in your living room with Klaussner’s Berger sofa. This handmade piece features a fully padded hardwood frame and cross wires on its metal sleeper mechanism for added support. 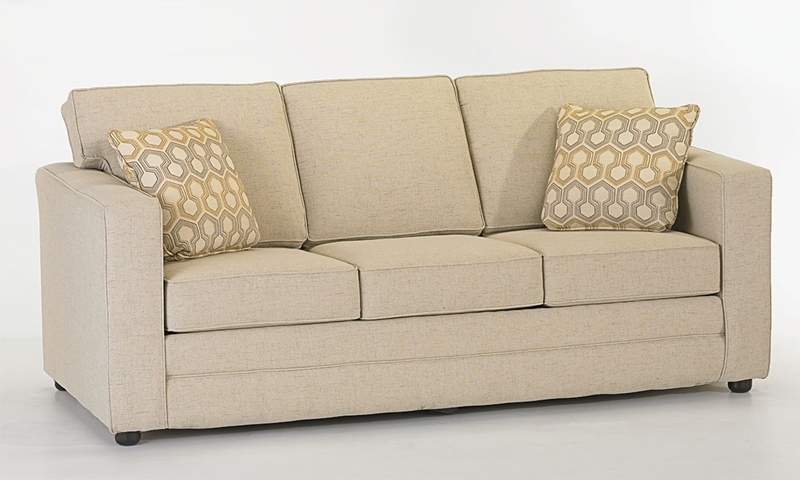 Welted box cushions, toss pillows and track arms atop dark, rounded feet give this sofa a polished, modern look in neutral hemp-colored upholstery. A recessed handle makes it effortless to transform the Berger into a queen size sleeper featuring a double-locking TV headrest and cool gel memory foam mattress. This sofa can be ordered as shown, or customized with a variety of different fabric options. Matching loveseat and chair also available. See store for details.